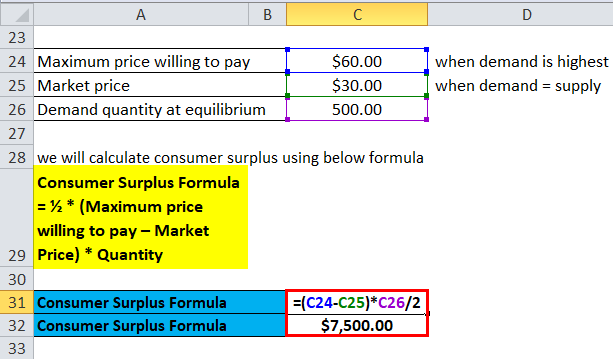 Now, let us see an example of Consumer Surplus Formula. A company came up with a new product that is auto dish cleaner, the company had conducted various market research and finalized its maximum price willing to pay $1,250 whereas the actual price of the product is $750. So, consumer surplus of auto dish cleaner is $500. Suppose, a consumer wants a television with 44 inches LED TV with HD quality and he is willing to pay $1,500 for it. He went to an electronics store and found that television with features he wanted is for a price of $1,200. Consumer surplus value is $300, here consumer has saved the same. 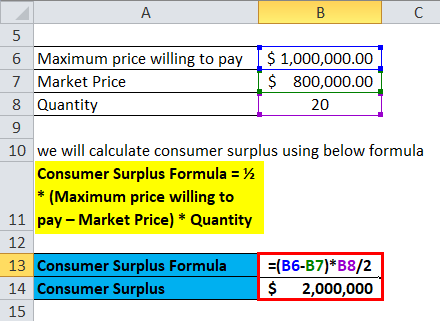 The formula for consumer surplus can be calculated by firstly, checking the consumer base and the highest price that consumer is willing to pay. Now, the initial price is already ready with the company and their subtraction will result in consumer surplus. Now, let us see extended consumer surplus formula. 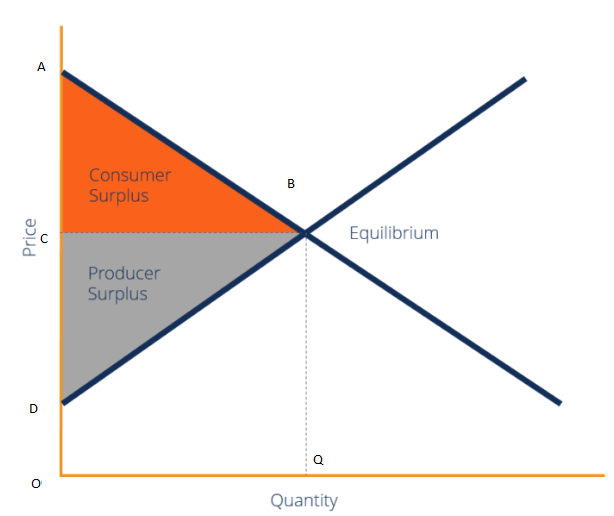 In below image of consumer and producer surplus in perfect competition, triangle ABC is consumer surplus and another triangle ABC BCD reflect producer surplus. 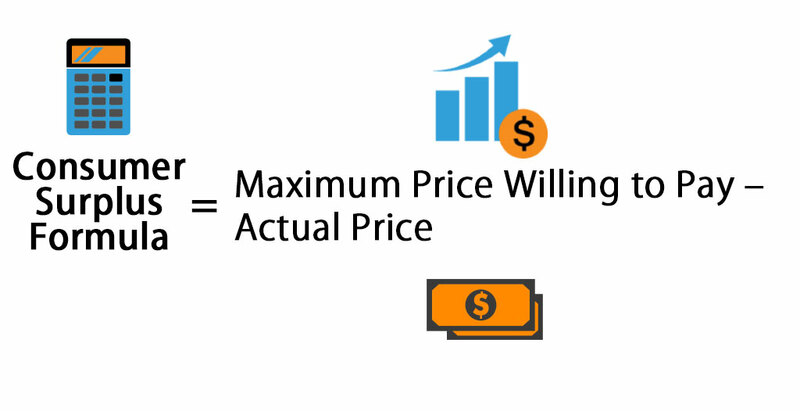 Here, point A and C represent maximum price, the consumer is willing to pay the market price respectively. Whereas, point B and Q corresponds to the quantity demand at equilibrium. Extended consumer surplus can be written as half of BC multiplies by AC or half of OQ multiplies by AC as OQ and CB is parallel. Extended consumer surplus can be calculated this way. Firstly we need to draw supply and demand curve with quantity on the horizontal axis and price on the vertical axis. Now, put the market price in equilibrium price. 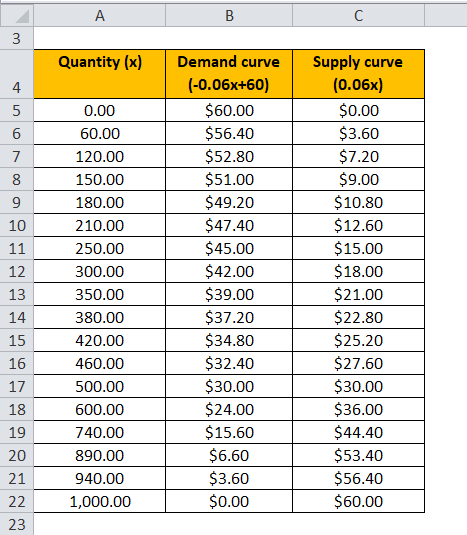 As per the law of supply and demand, the market price is a point of intersection between the demand curve and supply curve. Now a line needs to be created between the market equilibrium price and ordinate. Put a value in the above equation. Now, let us example to understand same. A consumer wants to buy high-tech car with all advanced features and he is ready to pay $1,000,000 which is the highest price among the customers and other customers are willing to pay only $800,000, Market price as per demand supply meet is $800,000. As per this price, car demand is 20 in equilibrium demand. Let us find consumer surplus for the same. Put values in the above formula. So, consumer surplus is $2,000,000. Suppose, a company wants to calculate consumer surplus with the demand function i.e. QD which is (-0.06x + 60) and supply function QS is 0.06x. Below is the function with change in quantity. So, consumer Surplus is $7,500. 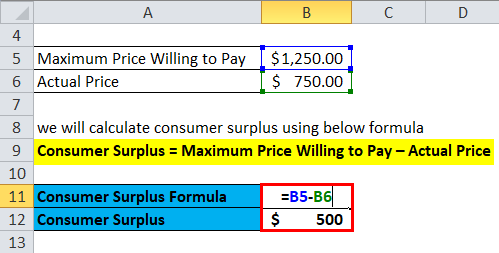 Consumer surplus equation helps in taking business pricing related decisions like pricing of selling of goods and services, the value of pricing. Consumer surplus equation helps in generating of maximum revenue as this company can get the best selling price with maximum revenue generation. Consumer surplus is a very important element in business especially when re-pricing is done or new product needs to be launched. The consumer surplus is based on an economic theory of marginal utility.